For a comfortable ride on Grand Lake in your boat, proper trim is important. If you have an outboard or I/O motor you can use it to help trim the boat by adjusting the angle of the drive to the transom. This is done with a switch usually located on the throttle control. When you are attempting to get a boat up on plane, the trim button will be pressed down or in depending on how yours is labeled. This will help lift the stern of the boat and keep the bow down. This helps to counteract the natural tendency for the bow to rise. Give sufficient power to the boat to put it on plane and away you go…boating Grand Lake comfortably. If your boat has trim tabs, lower them too which will help get your boat on plane quicker. As soon as the boat begins to plane, you will feel a sudden change in the boat attitude and speed. The bow will settle down to a more level position and speed will increase. At this point ease back the throttle to achieve a speed that is comfortable while maintaining plane. 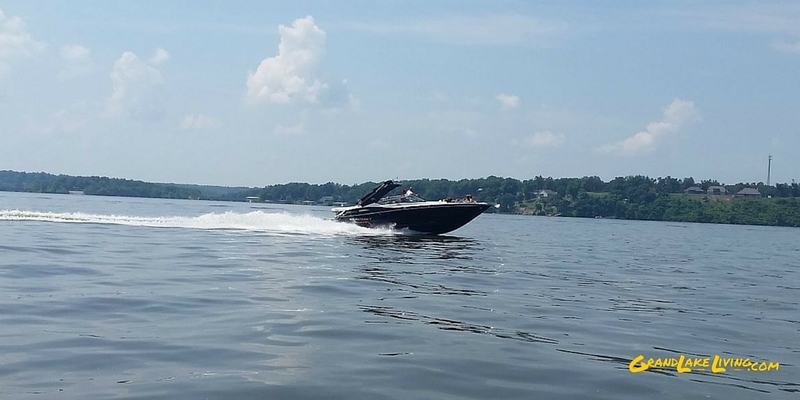 You may then adjust your trim, and your trim tabs, if equipped, as needed depending on your boat and prevailing conditions. Boat Smart from the start and take a boating course. The United States Power Squadrons offers many courses such as weather, seamanship, navigation, marine mechanics and marine electronics. NextRedneck Yacht Club Party – 2015 Style!